At present, there is only one civil airport in service in Nanjing: Lukou International Airport. This airport is the second largest airport in eastern China. It now has more than 135 domestic air routes and about 25 international air routes operated by over 25 airlines. The air network connecting Nanjing with over 115 cities and regions worldwide, around 30 of which are overseas destinations. This airport is 36 kilometer (22 miles) north from the central area of Nanjing. It has 2 terminal buildings, but only T2 is in use now. T2 has 4 floors: B1 is the metro station, F1 is the intercity-bus station and arrival hall for both international and domestic passengers, F2 is the departure hall for international passengers and F3 is the departure hall for domestic passengers. Passengers can transport between this airport and the other areas of the city by Metro Line S1 and S2 or by the shuttle bus. There are also intercity buses connecting the airport and the neighboring cities. How much does it cost to fly to Nanjing from overseas destinations? Averagely, the price range of the air tickets from Los Angeles is CNY 7,000 - 15,000, from Sydney is CNY 2,500 - 3,000, from Frankfurt is CNY 5,000 - 9,000, from Tokyo is from CNY 2,500 - 14,000 and from Hong Kong is CNY 1,000 - 3,500. Due to the frequent fluctuations of the international airfare to Nanjing, we recommend passengers to search for the real-time prices via the search box on page top, and passengers can also search the ticket prices of other flight routes there. 1. International passengers can compare ticket prices of direct flights to Shanghai and to Nanjing and choose the cheaper one. If those to Shanghai is much cheaper, fly there and then take a high speed train to reach Nanjing in 1.5-2 hours. 2. If you are planning to travel around China by air, it is better to avoid the public holidays and peak season. Every year, April to October is the peak season for travelling in China, and the domestic air tickets are mostly sold with a 20% - 40% off discount; from November to next March is the low season, and the discount for domestic air ticket is usually 30% - 60% off. In addition, air tickets are sold at the full price during public holiday most of the time. 3. Tickets for flights departing or arriving in the late night and early morning are usually sold cheaper than the tickets in other period. 4. Passengers with well-planned travel itineraries can buy the round-trip tickets, because the round-trip tickets are more likely to have a higher discount than the single tickets. Yes, more than 50 bullet trains departing from Nanjing South Station to Beijing and the second class seat ticket is CNY 443.5 and it costs about CNY 750 for first class seat. will there be any flights to hongkong this week? Flights are already in normal schedule. I need flights from Kathmandu , Nepal to Nanjing,China. which Transit better? I am travelling by flight from Nanjing to Beijing. I wish to know the limits and how items like flat screen tvs with me will be treated. usually most airlines allow 20kg as checed luggage and 5kg carry-on luggage. The electronic devices should be arranged as carry-on luggage. Some budget airlines have different policy, you need to contact the airline directly for advice. 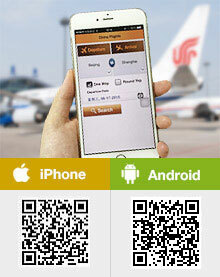 How to get to U Plus Hotel(Xinjiekou Confucius Temple) from airport? I tried to send email and ask the hotel but no reply. Would like to know how to get to the hotel from the airport? I cannot fond your hotel online, but if it is near Confucius Temple, yuo mat take the subway Line S1 first to Nanjing south station and then change to line 3 to the Confucius Temple(Fu Zi Miao).